There have been lots of birthday celebrations as of late- from Freddie Mercury to my mother to my goddaughter to my good friends who just welcomed a second child on the same day they welcomed their first two years ago... will that make birthday parties easier or harder? Either way, I gotta send out a public Happy Birthday wish to Degen Pener. Few folks have shaped my HIV educational journey the way Degen did back in 1996. 1996... that was the year everything for me changed. I realized I wanted to speak out about HIV for the first time in my life, after a decade of being diagnosed. I send a handwritten letter to Poz Magazine’s then editor-in-chief, Sean Strub, and a couple of months later I got a phone call from Sean inviting me to NYC to be interviewed for the magazine. I was pretty stunned. The writer who got the unenviable job of interviewing a 20-year old on his first trip to NYC??? Sean was so excited. “I’ve been wanting Degen for a long time.” I assumed he meant for a writing assignment. I was in NYC for close to a week, and met with Degen several times. The magazine came out about four months later, and the wait was agonizing. 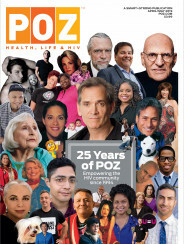 Even more so when Sean informed me that I was going to be on the cover... that experience more than anything cemented my decision to make HIV education and awareness the focal point of my life. When the magazine came out, my hands were shaking as I read Degen’s assessment of my life; and I laughed. Probably cried at points, too. As someone a bit older and wiser, he really took in many of the aspects of my diagnosis that I’d either brushed under the emotional rug or had not yet incorporated into my educational message. His article was the blueprint for how I framed my experiences from that moment on. I had all the energy and enthusiasm to educate, and Degen’s witty writing style was a godsend to someone who was paying attention even though they didn’t quite realize they were looking for and needed direction. So happy birthday, Degen. Big hugs from a very grateful positoid.